This week's giveaway is from Michael of Smirking Tiger and he is giving away a Steam Deco Metal Cuff Bracelet . Give your guy some style with this original mixed metal cuff bracelet created by Michael of Smirking Tiger. Michael juxtaposes copper, painted copper and aluminum accents to create a unique geometrical design. He also incorporates eyelets, round holes, and round stamps to accent the unique design. The mixed metal cuff includes aluminum wire accents to accent the ends of this unique cuff bracelet. The Metal cuff bracelet is approximately 1.5" wide and is sized to fit and average sized wrist and incorporates copper and aluminum. The unique design melds together Steampunk and Art Deco themes and can be worn as a man's wrist cuff or a woman's arm band and is sturdily constructed, but surprisingly light, comfortable and wearable. Visit Smirking Tiger, pick your favorite item and leave a comment on this post about it. (Scroll to bottom of post and click on Comments) Please make sure you include your email address so we have a way to contact the winner! 7. Become a Facebook Fan of Smirking Tiger. Comment back here with your Facebook name. Existing fans just leave your Facebook name here. 8. Follow Smirking Tiger on twitter. Comment back here with your Twitter link. Existing followers just leave your Twitter link here. 9. Follow Mellow Fury on Pinterest. Comment back here with your Pinterest link. Existing followers just leave your Pinterest link here. Contest ends Saturday, July 13th, at 12:00 noon Central. One winner will be chosen by Random.org. Fun Friday Finds: Summer in Minnesota--Don't Blink! It has been said that Minnesotans talk about the weather a lot. Really a lot. Well, yes. Yes we do. That's because the weather gives us so much to talk about, such as, "Can I borrow your chain saw? I need to get this tree off my car!" During a recent brief interlude in said weather, after cleaning up branches and debris in my yard amidst dripping dew points following a double whammy of tree-toppling storms, then escaping indoors and giving thanks that our house was among the few that still had power, I came across a cheery claim from a local tourism website that National Geographic had awarded our fine state with the honor of being one of the Top 10 Summer Destinations in the World. Among the reasons? Our Amazing Weather, of course. Says the booster website: "Wouldn't you rather enjoy the outdoors in cool, 80 degrees weather?" You bet we would! And all you have to do is pick the right couple of days to visit! Good luck with that! But I'm not complaining. No, indeed not! Like all those people who were out working together to remove the trees from their streets last weekend, I like it here. Never a dull moment! And when we do have an 80-degree day with low humidity, you can be certain that not one of us takes it for granted. 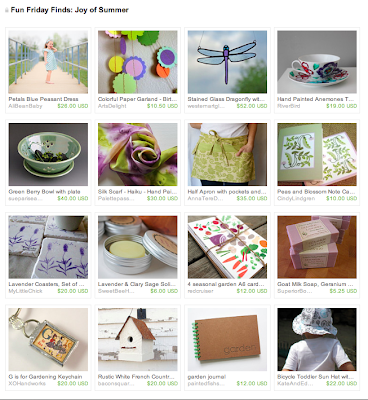 Herewith, a Minnesota handmade collection on Etsy that evokes the delight of a perfect summer day and lush midsummer gardens. 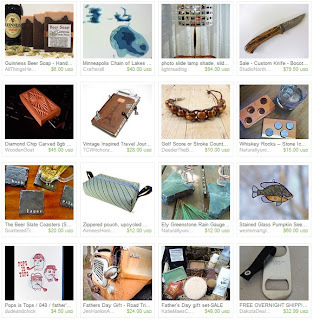 (Click on the image to visit the treasury on Etsy, and the individual shops.) Salut! 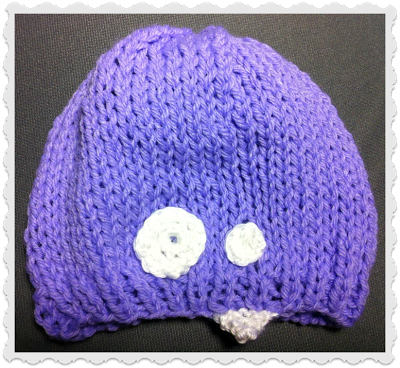 This week's giveaway is from Brenda of Mellow Fury and she is giving away a unique crazy eyed monster baby hat. Brenda knit this unique, soft little monster hat in light purple yarn for babies. The adorable, crazy eyed monster even includes a baby tooth! He is machine washable and measures 12" around when lying flat. It easily stretches to 16" as needed. Visit Mellow Fury, pick your favorite item and leave a comment on this post about it. (Scroll to bottom of post and click on Comments) Please make sure you include your email address so we have a way to contact the winner! 7. Become a Facebook Fan of Mellow Fury. Comment back here with your Facebook name. Existing fans just leave your Facebook name here. 8. Follow Mellow Fury on twitter. Comment back here with your Twitter link. Existing followers just leave your Twitter link here. 9. Follow Mellow Fury on Pinterest. Comment back here with your Twitter link. Existing followers just leave your Twitter link here. Contest ends Saturday, July 6th, at 12:00 noon Central. One winner will be chosen by Random.org. Summer solstice is the longest day of the year and happens to be my mom's birthday (Happy Birthday, Mom!). Summer is for grilling hot dogs and burgers. It's for reading a good book in the shade of an oak tree and sitting around the campfire, roasting marshmallows. Summer is swimming, going barefoot and fishing off the dock. All of these are wonderful but make sure you don't forget the bug repellent and the sunscreen! Vegetables - well most of them - are goodness (i.e. I just don't like some veggies). Fresh vegetables are awesome. But fresh vegetables from the Farmers Market are absolutely devine! 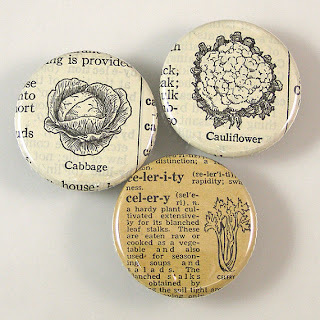 Likewise, our HandmadeMN members are fans of fresh veggies too - take a look at their unique finds! 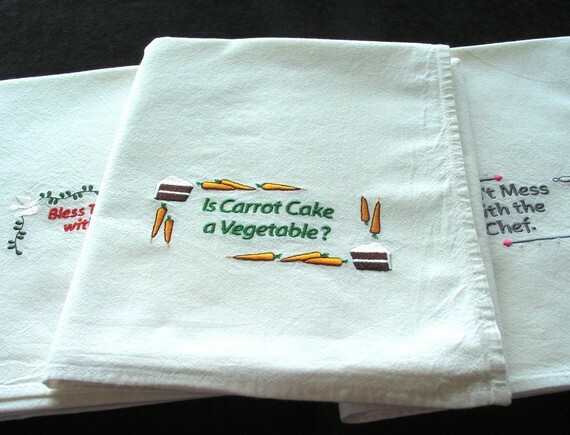 This is my kind of vegetable - Carrot Cake!! It's definitely a vegetable!! Wouldn't you just love to have one of these embroidered dish towels from GrandmasCraftGarden in your kitchen. Corn is one of my favorite vegetables and in the fall I can't get enough fresh, sweet corn (with lots and lots of butter). 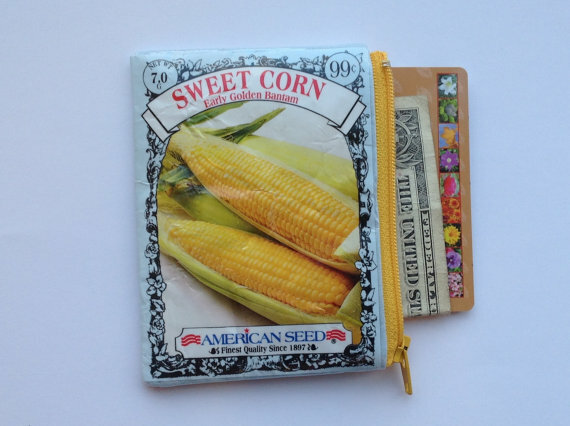 Until then, I'm just going to drool over SewTini's upcycled coin purse. Quick - can you name 3 vegetables that begin with the letter "C"? We know that XO Handworks can! Take a look at these magnets made from vintage dictionaries. This week's giveaway is from Laurel of Abundant Empress. She is giving away this wonderful painting. This magical lady contemplates the mysteries of the starry night that surrounds her as her hair is lifted on the winds. 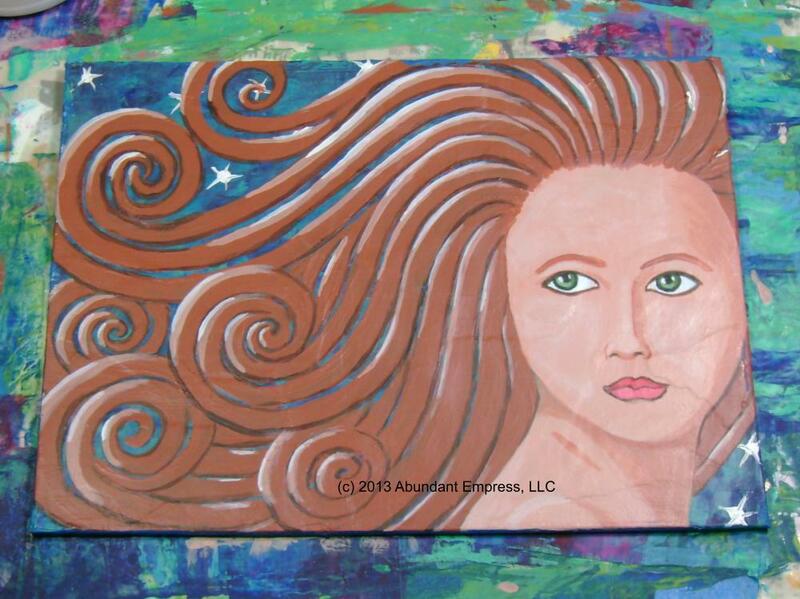 This is one of Laurel's original mixed-media paintings, on a 6" X 8" canvas board. Laurel specializes in upcycling pre-owned and found items, transforming them into works of art and whimsy through hand-painting. She is inspired by myth, legend, folk and fairy lore, magic, history, and color just to name a few. Contest ends Saturday, June 29th, at 12:00 noon Central. One winner will be chosen by Random.org. 7. Become a Facebook Fan of Abundant Empress. Comment back here with your Facebook name. Existing fans just leave your Facebook name here. 8. Follow Abundant Empress on Twitter. Comment back here with your Twitter link. Existing followers just leave your Twitter link here. 9. Follow Laurel's blog. Leave a comment here letting us know you are a follower. If you are already a follower, leave a comment anyway, as each comment is an entry. 10. Follow Laurel on Pinterest. Comment back here letting us know you are a follower. 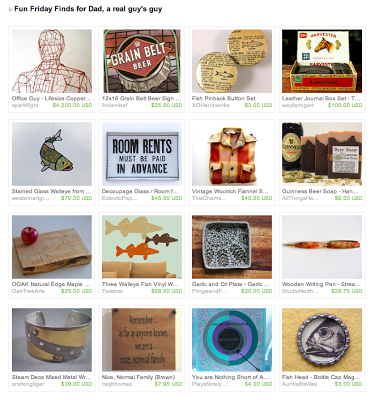 Fun Friday Finds for Dad! Looks like I had the same idea that Sharon had last week. Great minds, right? Just a couple more days until Father's Day! This week's giveaway is from Emily of Bella Maria Creations and she is giving away a Brilliant Blue Ruffle Newborn Headband. Who can resist this sweet newborn headband? Emily created the newborn headband especially for your stylish princess. Your baby will look so cute in this brilliant blue ruffle headband. Emily fashioned a blue satin flower and then embellished its center with blue lace and a cute lime green button at the center of it. There is a completely adorable lime green ruffle elastic headband that compliments the button at the center of the flower. It will be so adorable on your little darling. Visit Bella Maria Creations, pick your favorite item and leave a comment on this post about it. (Scroll to bottom of post and click on Comments) Please make sure you include your email address so we have a way to contact the winner! 7. Become a Facebook Fan of Bella Maria Creations. Comment back here with your Facebook name. Existing fans just leave your Facebook name here. 8. Follow Bella Maria Creations on twitter. Comment back here with your Twitter link. Existing followers just leave your Twitter link here. 9. 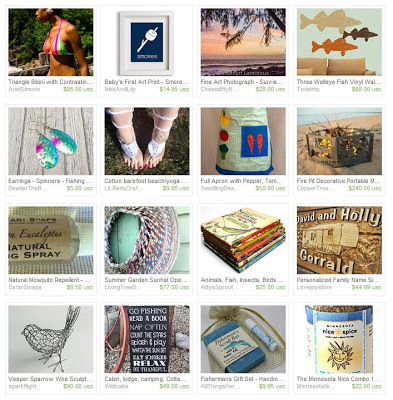 Follow Bella Maria Creations on Pinterest. Comment back here with your Twitter link. Existing followers just leave your Twitter link here. Contest ends Saturday, June 22nd, at 12:00 noon Central. One winner will be chosen by Random.org. Ah, the perennial dilemma approaches in just over a week: what to get Dad for Fathers' Day. After all, this is the guy who can be sitting on the couch with a Grain Belt in his hand, happily watching a basketball game one moment; and the next, at the jangle of his cell phone, jump up and head out on a blustery winter day to change a flat tire for his teenage daughter. He's the guy who leaves his comfortable office in the middle of the afternoon on a rainy day, and hops on his bicycle to go help his son deal with the aftermath of an unfortunate encounter between the youth's motorcycle and a distracted driver, helping maneuver the heavy and cumbersome two-wheeler several blocks to a safe resting spot, then cleans himself up and pedals back to work. And what does he say about these Dad heroics? I know, because we have one of these guys at our house: "It's what I signed up for." What do you get for a guy like that? How about something unique and handmade, or something a little bit quirky to make him smile, along with a note acknowledging how awesome he is (but don't get mushy, you know he doesn't go in for that sort of thing). Over the past few months weather has certainly been a topic of discussion around the water cooler here in Minnesota. Most of us had hoped the long, cold snowy winter would give way to one of our wonderful springs. But no such luck. Spring started late and now it has been wet, rainy and stormy for oh so long. However, being hardy Minnesotans, members from our HandmadeMN team have handily met the challenge of bringing beauty to this wet, soggy spring. 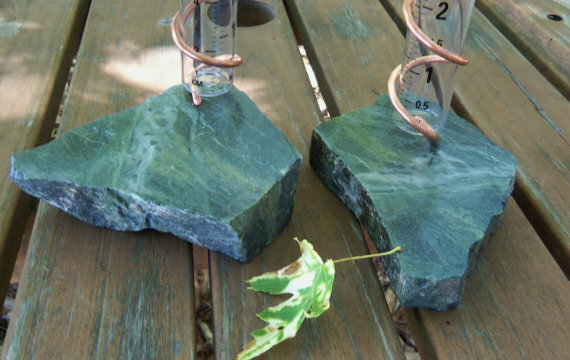 Naturallyuniquerock has crafted these stunning rain gauges from Ely Greenstone. They would make a wonderful addition to your backyard. And here's a bit of trivia! Do you remember those old green shingles? Did you know they were made from ground up greenstone? 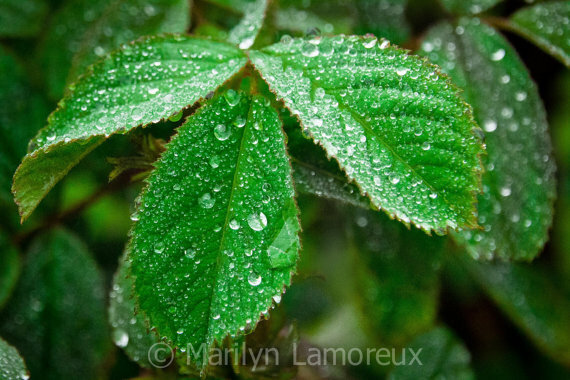 Raindrops can be beautiful and stunning as evidenced by this photo from ChasedByBeauty. We can find beauty everywhere in any kind of weather here in good ole Minnesota. 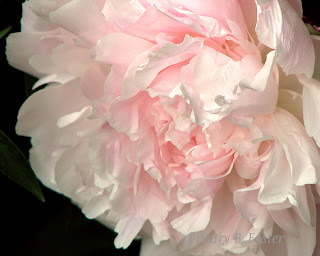 And, hopefully, in the next week or so all of our peonies will finally be in bloom. MaryFosterCreative has certainly captured the beauty of these Minnesota spring flowers in this photo. Despite the rain, here's hoping that you are having a great spring because, afterall, It's A Minnesota Thing! This week's giveaway is from Becca of KnitNax. 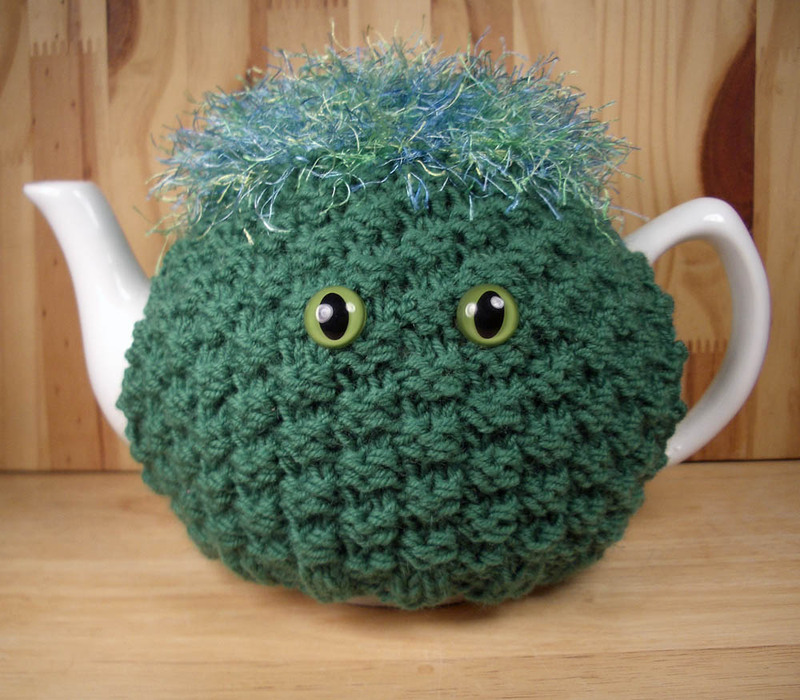 She is giving away this adorable tea cosy. Add some fun and whimsy to your next afternoon tea when you invite this terribly cute CozyKin tea cosy to join you for some biscuits and Toasted Rice Green tea. This original design is sure to keep your tea toasty warm and put a twinkle in your eye. This CozyKin is hand knit using green wool to keep your tea nice and hot. His hair incorporates a strand of multi-colored fuzzy poly-acrylic yarn knit with the wool to complete his stylish hair-do. He is sized to fit either a 6 cup or 8 cup teapot. Contest ends Saturday, June 15th, at 12:00 noon Central. One winner will be chosen by Random.org. 7. Become a Facebook Fan of KnitNax. Comment back here with your Facebook name. Existing fans just leave your Facebook name here.